Frances Kweller has been in the tutoring business for about 15 years. She opened her first office five years ago in Forest Hills after graduating from law school. Her business, Kweller Prep Tutoring and Educational Services, offers specialized high school, college, and graduate school test preparation and counseling services. Its programs are designed to help ambitious students reach their academic goals. The Kweller Prep tutoring center in Forest Hills serves as a learning incubator where parents, serious students, teachers, tutors, and counselors can learn from one another and grow. Kweller Prep, a woman-owned small business located in Forest Hills, was closed in October 2012 after Hurricane Sandy devastated areas of New York City. It was reopened a month later on November 6, 2012. Frances Kweller needed money to recover her business, and consulted the York College SBDC looking for assistance in securing loans and grants to repair her school. She was able to get the first New York Hurricane Sandy disaster loans from the SBA and NYBDC. 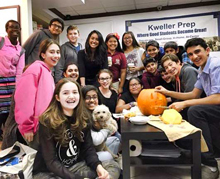 The disaster funds gave Kweller Prep Tutoring & Education Services the working capital it needed to get the school back on track so it could return to serving the Forest Hills community. Frances Kweller received a $30,600 SBA disaster loan, and a $25,000 loan and $10,000 grant from the Empire State Development’s Storm Sandy Emergency Loan Fund. As a result of the funding, Kweller Prep was able to recover with 50 jobs saved and 50 new jobs created. A year after the disaster, Frances Kweller opened a new office in Manhattan.